Lash's Unique Animal's is a Nationally known farm raising top quality Llamas, Miniature & Toy Australian Shepherds. Their farm holds several records in the Llama industry. One special memory was at the 2009 LFA (Llama Futurity Association) Fall Harvest Show and The LFA World Futurity. Another was at The 2013 Gathering and LFA World Futurity where our Llamas won several Championships. We are so grateful to the production of our llamas and all of our friends. We look forward to sharing more with them in the future. We generally have Llamas available for sale which may be listed on the Llamas for Sale page. 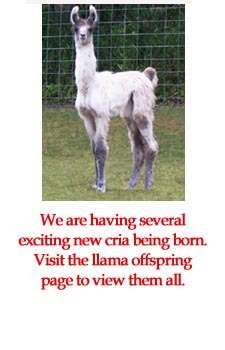 We also have our current years cria shown on the llama offspring page. We try to produce a couple of litters of exceptionally beautiful Miniature and toy Australian Shepherd litters per year. Of course that is in God's hands and in His timing! A lot of consideration is given to individual animals before they enter the breeding program on our farm. Conformation, bloodlines, disposition, size, coloring, etc. Our animals are worked with and handled often. or their offspring. Your inquiry is very important to us! If you send an email and do not receive a response within 48 hours please call 517-467-2709. Heavenly Father Thank You for the gift of another day. Thank You for this day that You have made. Thank You for each dream you have given me. Thank You for Your Blessings and Favor. May we do Your Will always. Guide and direct each one of us and keep us true to Thee. In Jesus’ name, Amen. Winner's Circle 2017 & 2018! See generations of our Award Winning Llamas produced on our Farm! 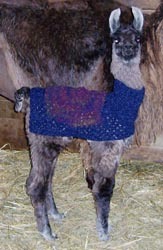 CLICK HERE FOR CRIA SWEATERS, CRIA NECK WARMERS, LLAMA HALTER & LEAD ROPES, T-SHIRTS, AND MORE UNIQUE GIFTS!